I had my first OB apt on Monday. It was nice to see my doctor and favorite nurse again. It was just over a year ago that the girls were born. Crazy how time passes so quickly. We had a long (1.5hr) visit to discuss how we are going to handle this pregnancy since I am definitely considered high risk. Twins are always categorized as high risk to begin with, but it is even more of a concern since my girls came at 27.5 weeks. We want to do everything possible to not have such a traumatic birth this time around. He discussed possible weekly progesterone injections and frequent ultrasounds to measure my cervix. If they notice any shortening of the cervix they would do a cervical cerclage. My goal right now is to make it to Halloween (32w), anything after that is even better. The genetic testing is the next big milestone. A new non-invasive test has been released called MaterniT21. It tests for the same chromosomal abnormalities as the CVS test, but it can be done through a simple blood test, instead of having giant needles piercing through your uterus. I was so happy to hear of this test and I am going to do it tomorrow. The only problem with twins is that if something bad comes up I will still have to do CVS or Amnio to find out which baby has the problem. 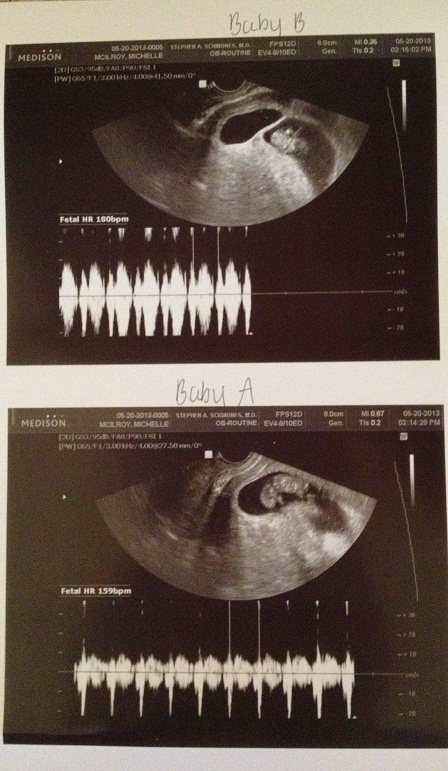 I’m really praying that the results come back good and we can relax and finally start to enjoy this pregnancy….